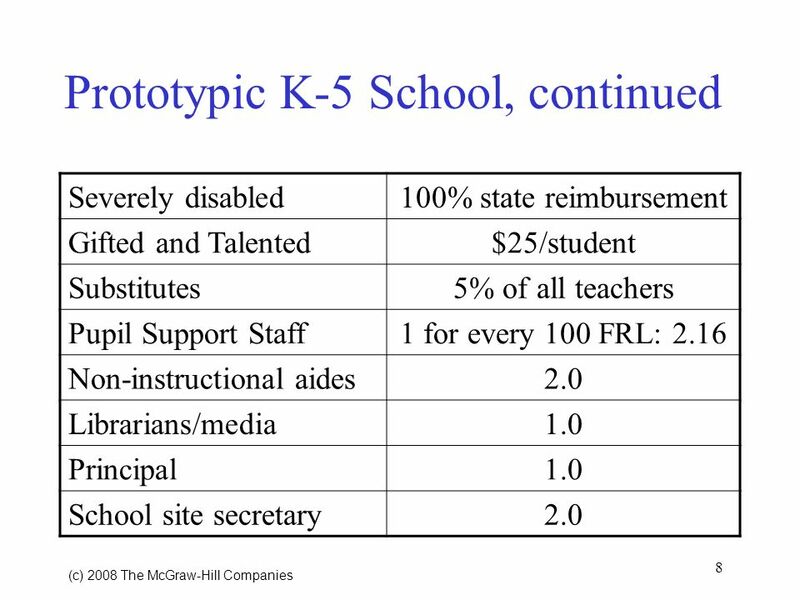 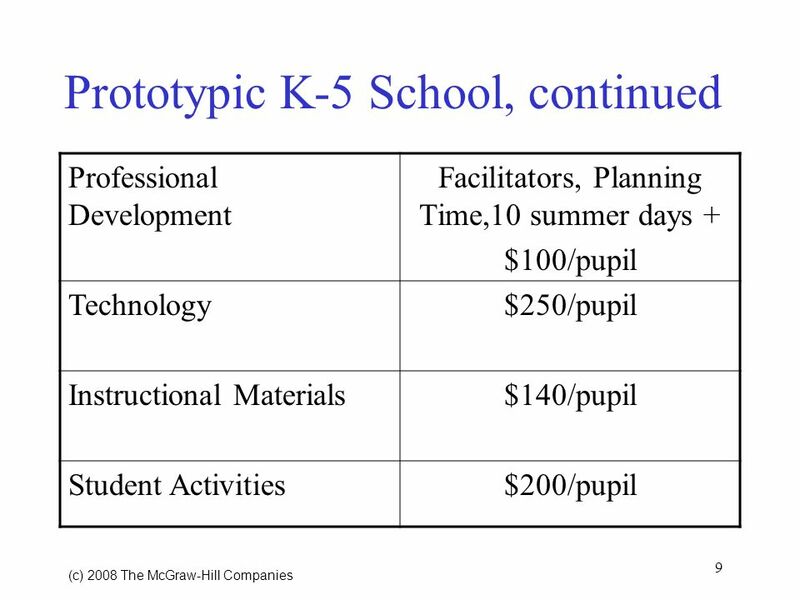 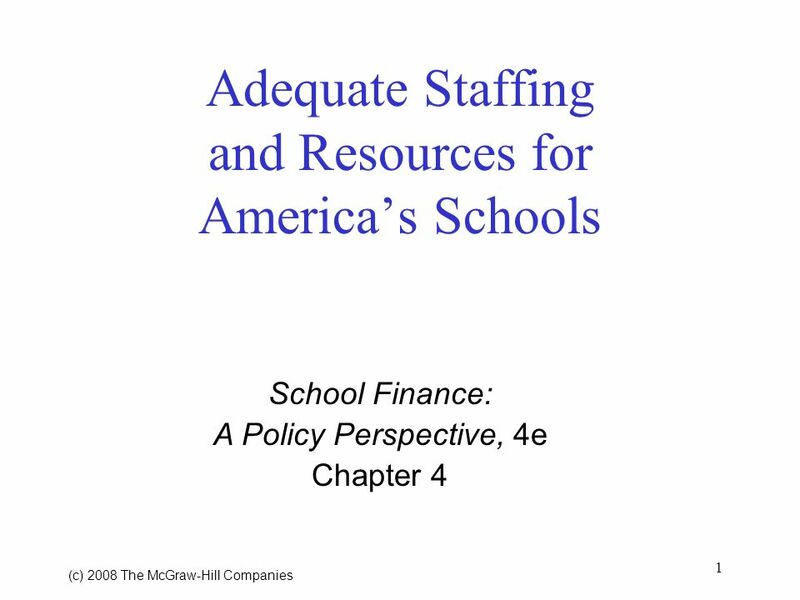 1 (c) 2008 The McGraw Hill Companies Adequate Staffing and Resources for Americas Schools School Finance: A Policy Perspective, 4e Chapter 4. 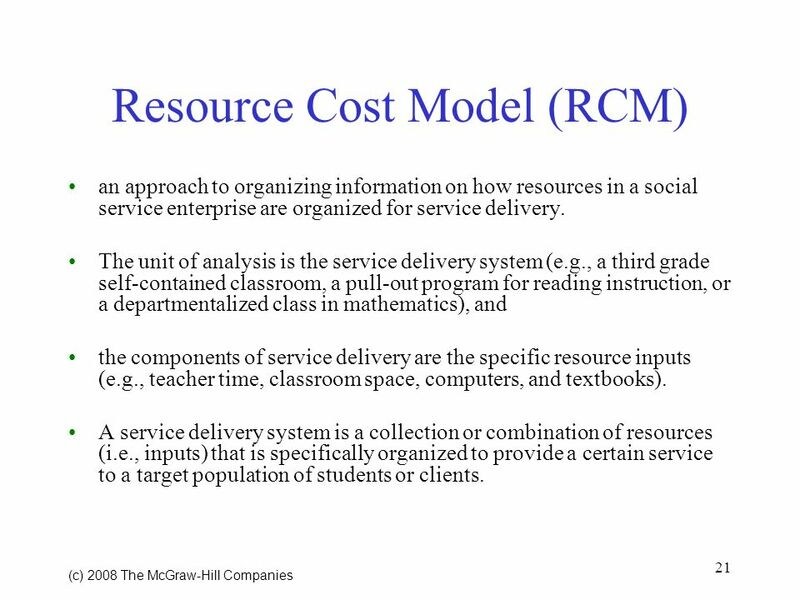 21 21 (c) 2008 The McGraw Hill Companies Resource Cost Model (RCM) an approach to organizing information on how resources in a social service enterprise are organized for service delivery. 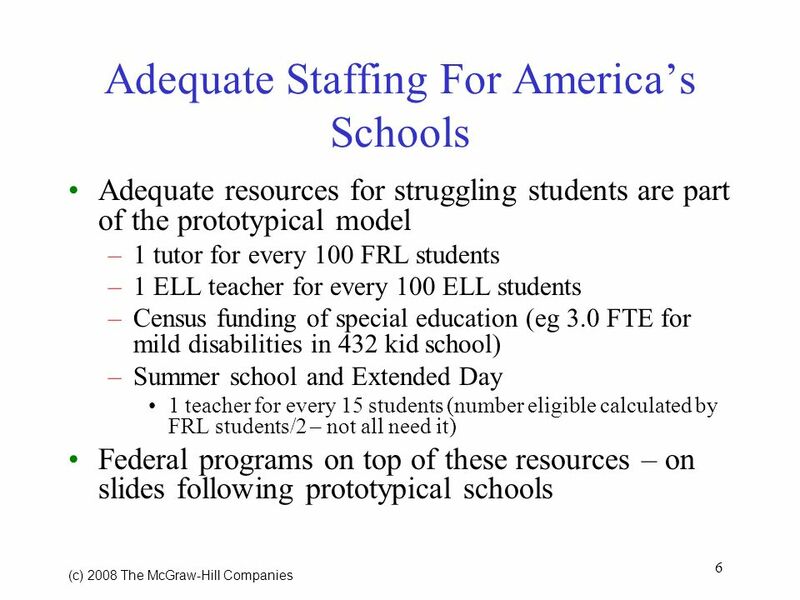 The unit of analysis is the service delivery system (e.g., a third grade self-contained classroom, a pull-out program for reading instruction, or a departmentalized class in mathematics), and the components of service delivery are the specific resource inputs (e.g., teacher time, classroom space, computers, and textbooks). 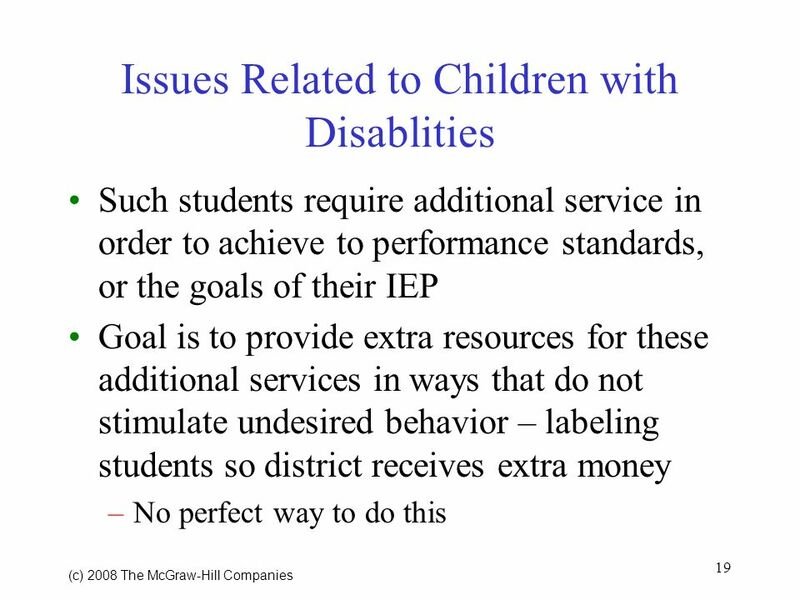 A service delivery system is a collection or combination of resources (i.e., inputs) that is specifically organized to provide a certain service to a target population of students or clients. 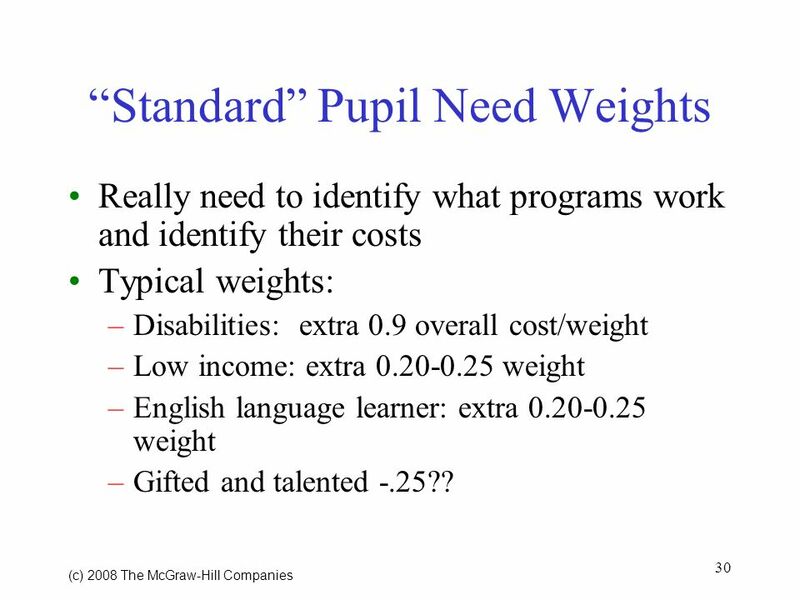 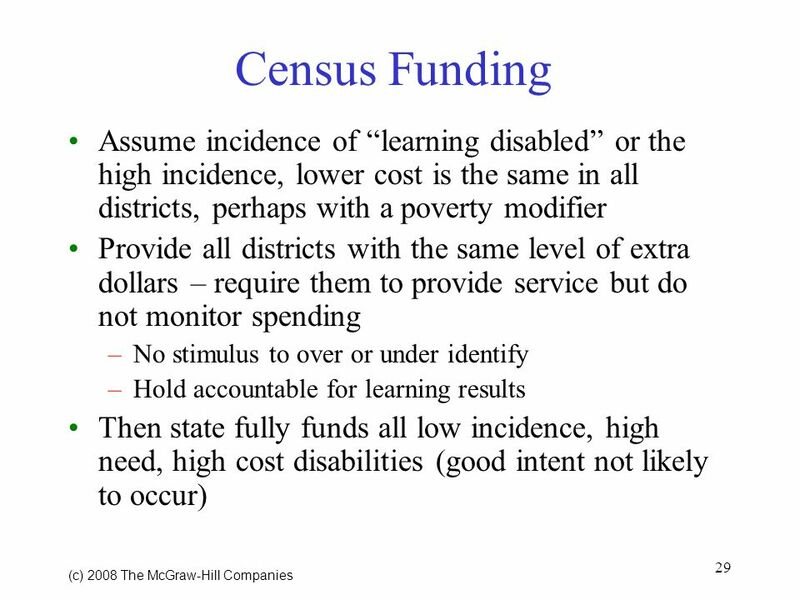 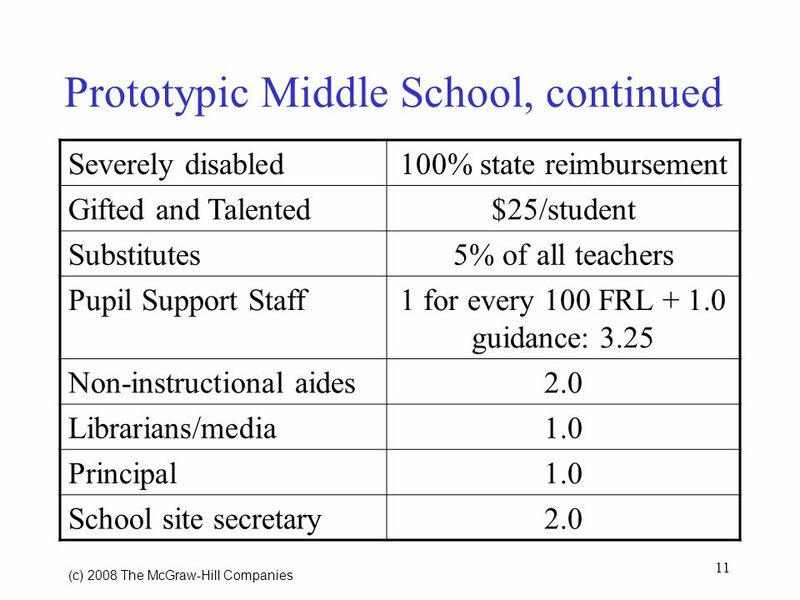 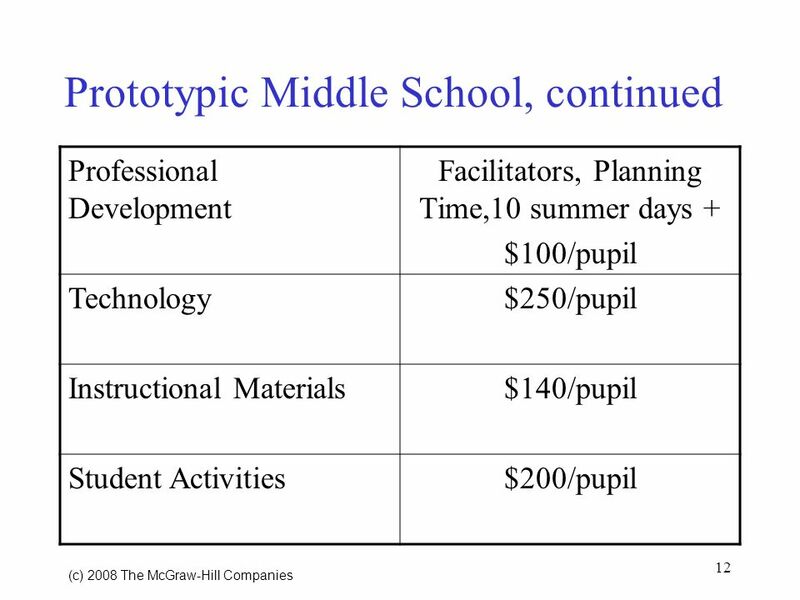 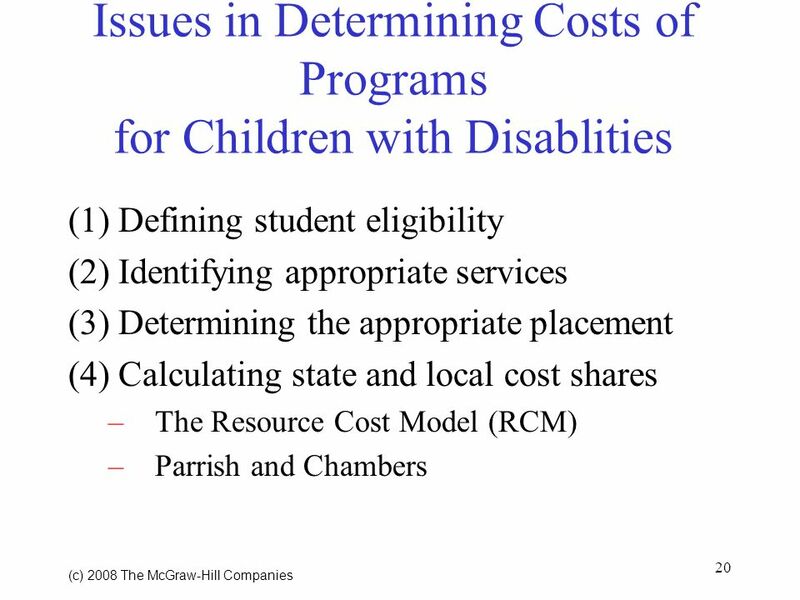 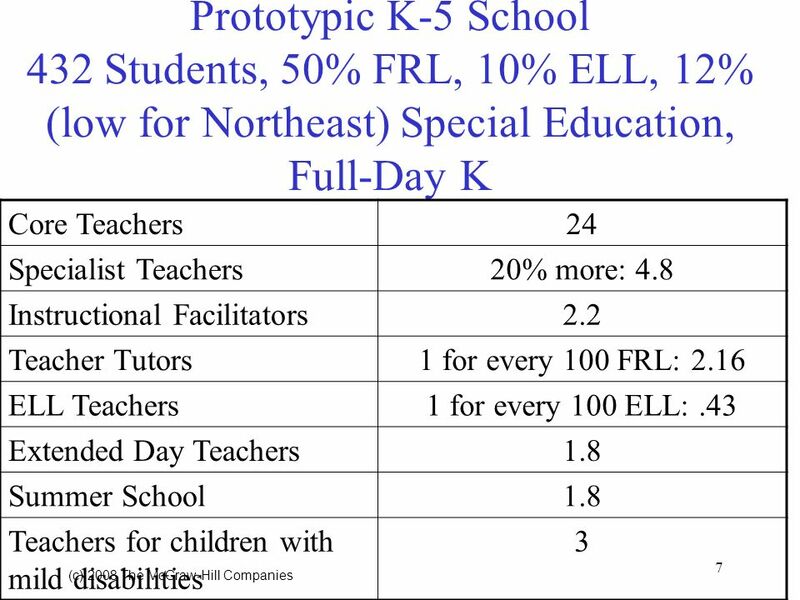 30 30 (c) 2008 The McGraw Hill Companies Standard Pupil Need Weights Really need to identify what programs work and identify their costs Typical weights: –Disabilities: extra 0.9 overall cost/weight –Low income: extra 0.20-0.25 weight –English language learner: extra 0.20-0.25 weight –Gifted and talented -.25?? 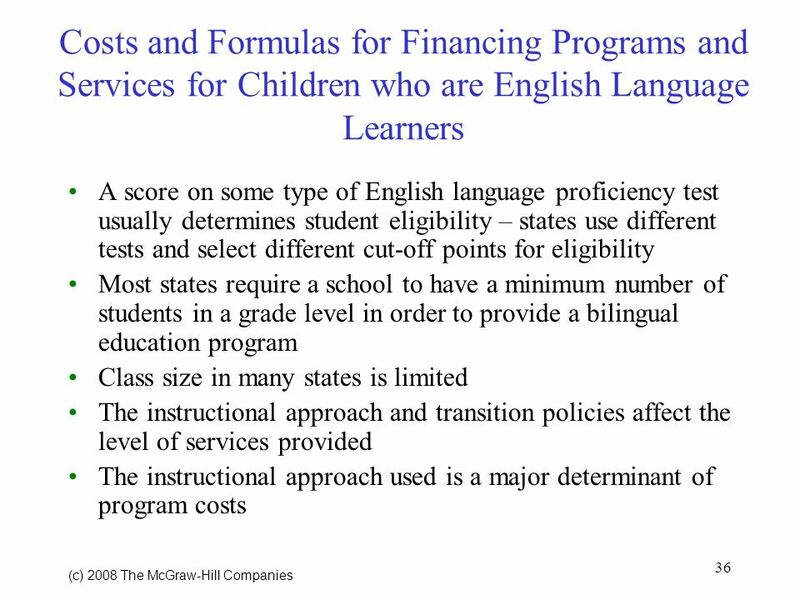 38 38 (c) 2008 The McGraw Hill Companies Sheltered English Instruction an instructional approach that engages ELLs above the beginner level in developing grade-level content-area knowledge, academic skills, and increased English proficiency. 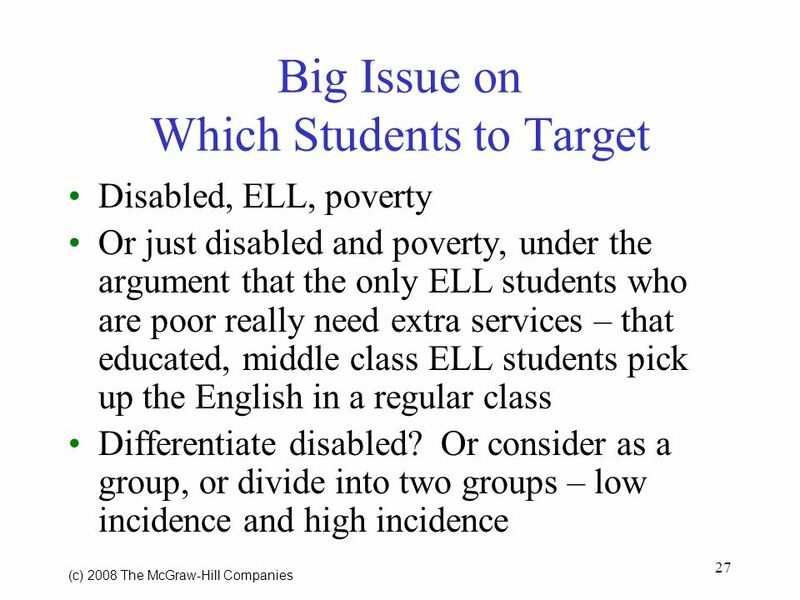 In sheltered English classes, teachers use clear, direct, simple English and a wide range of scaffolding strategies to communicate meaningful input in the content area to students. 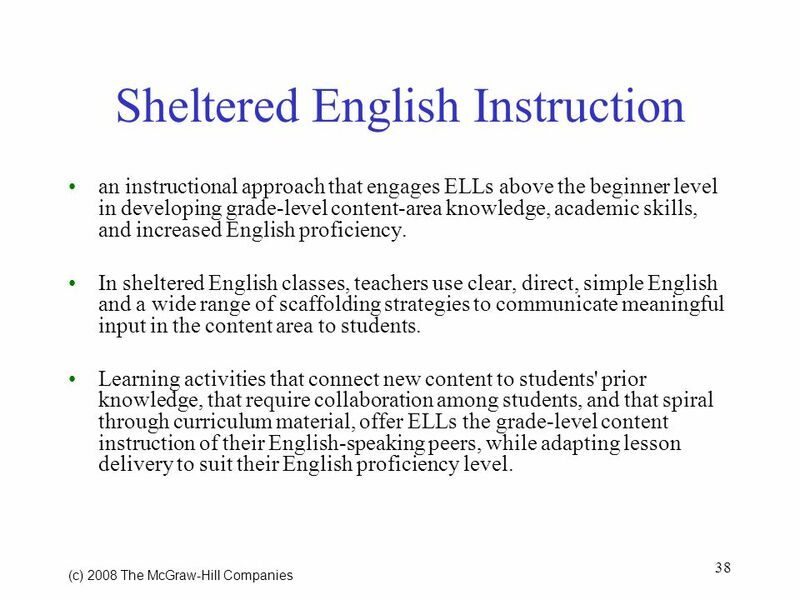 Learning activities that connect new content to students' prior knowledge, that require collaboration among students, and that spiral through curriculum material, offer ELLs the grade-level content instruction of their English-speaking peers, while adapting lesson delivery to suit their English proficiency level. 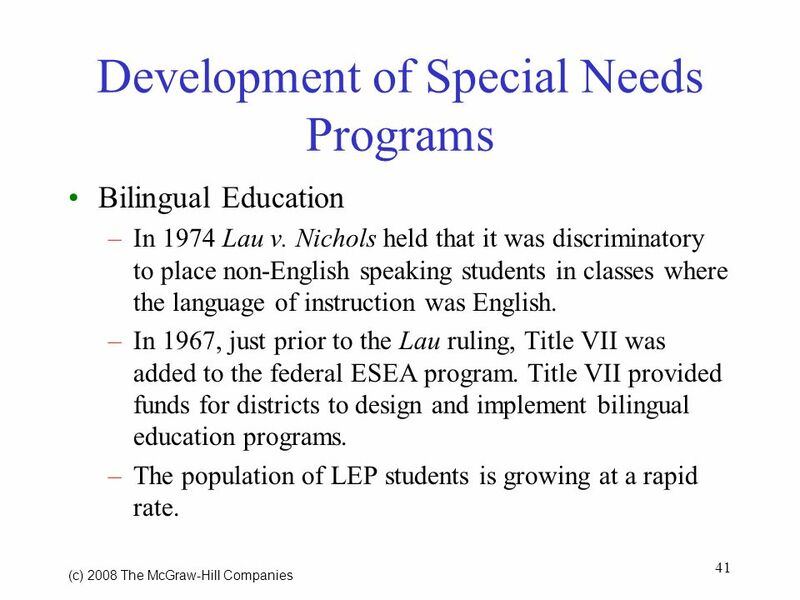 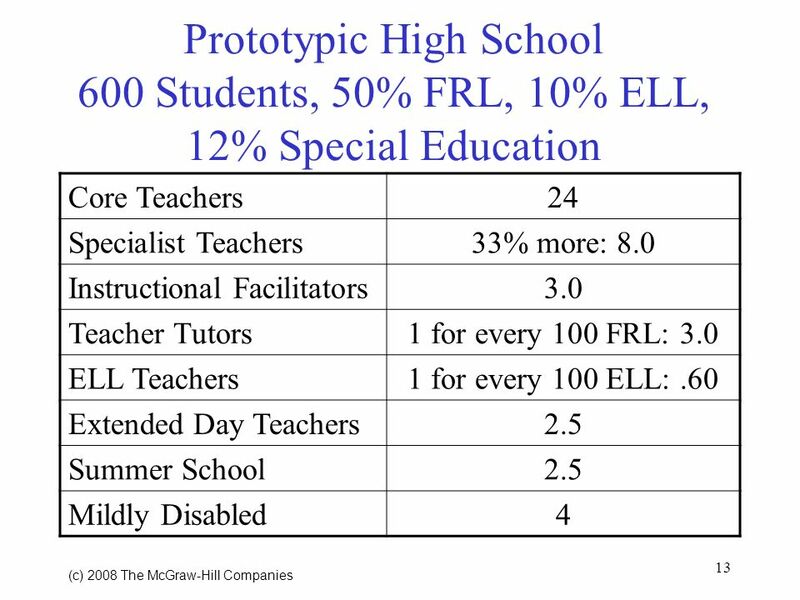 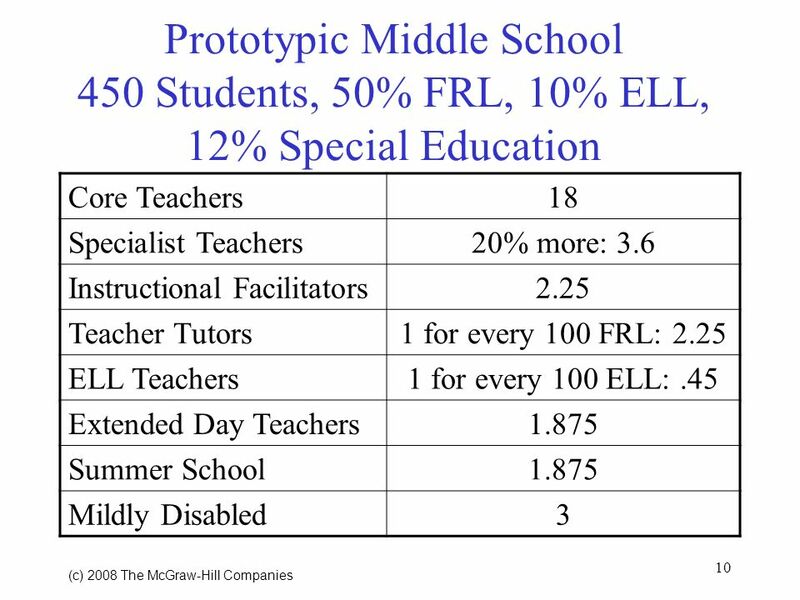 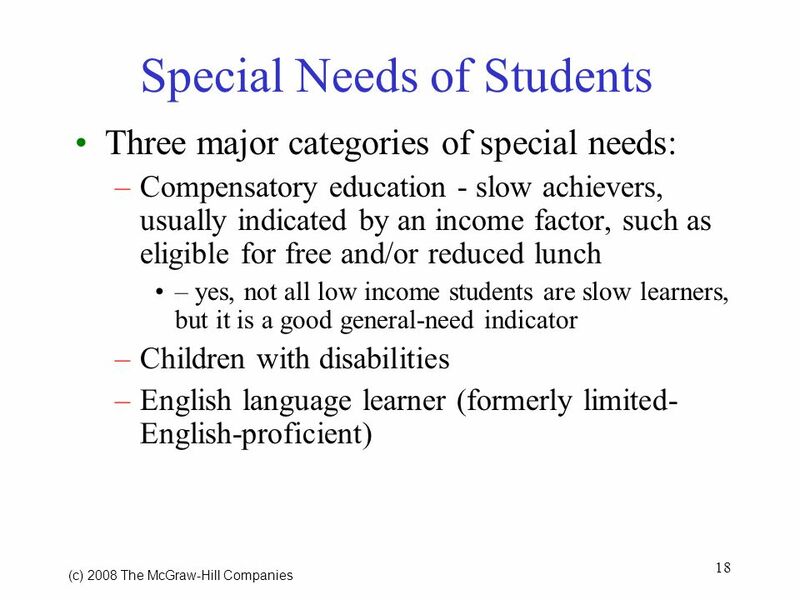 41 41 (c) 2008 The McGraw Hill Companies Development of Special Needs Programs Bilingual Education –In 1974 Lau v. Nichols held that it was discriminatory to place non-English speaking students in classes where the language of instruction was English. 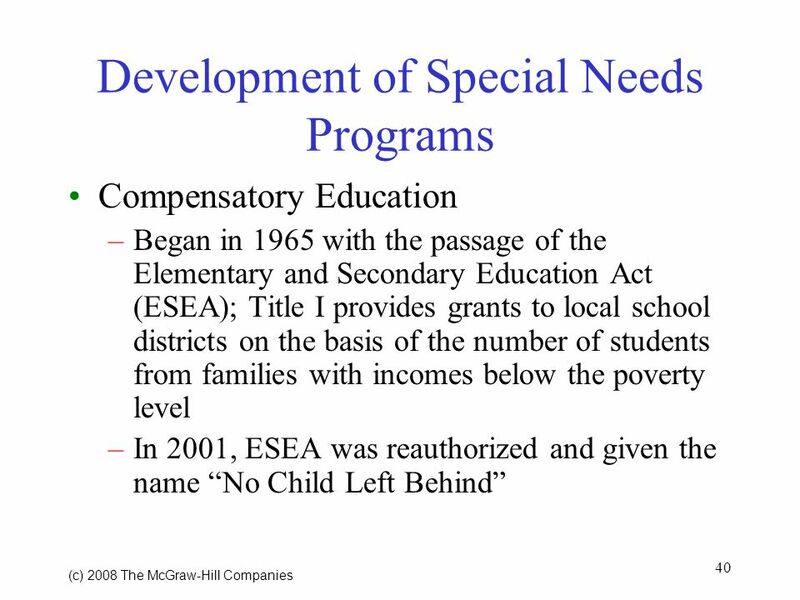 –In 1967, just prior to the Lau ruling, Title VII was added to the federal ESEA program. 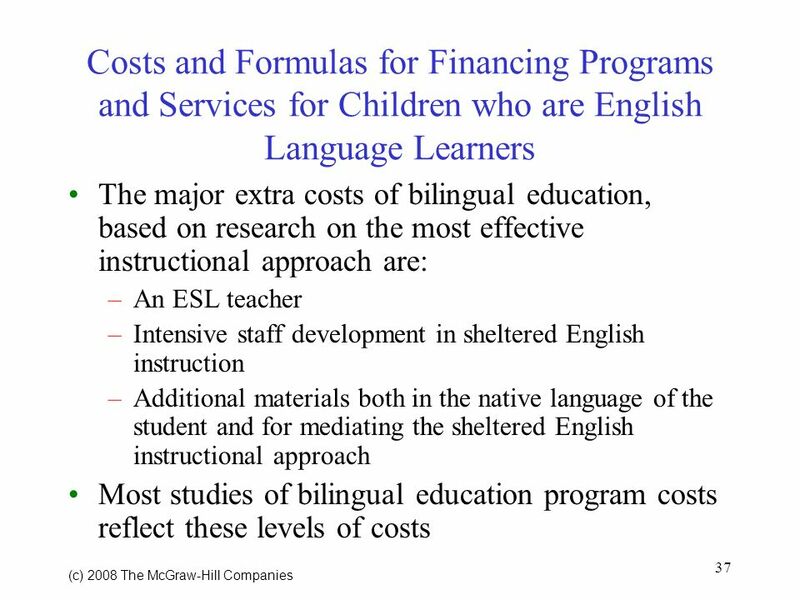 Title VII provided funds for districts to design and implement bilingual education programs. 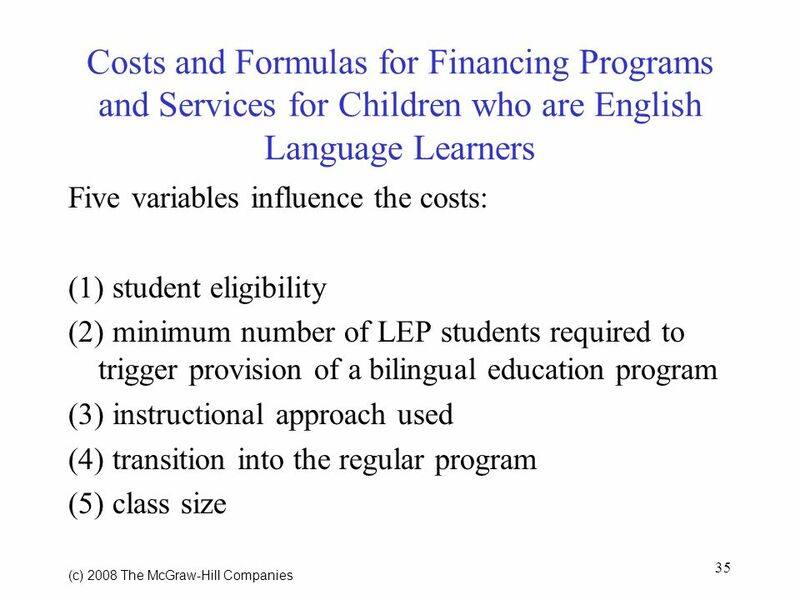 –The population of LEP students is growing at a rapid rate. 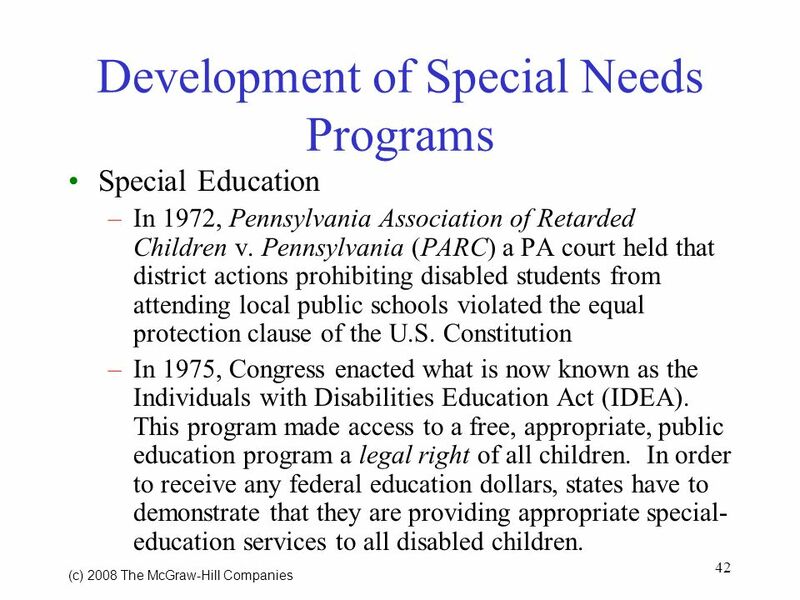 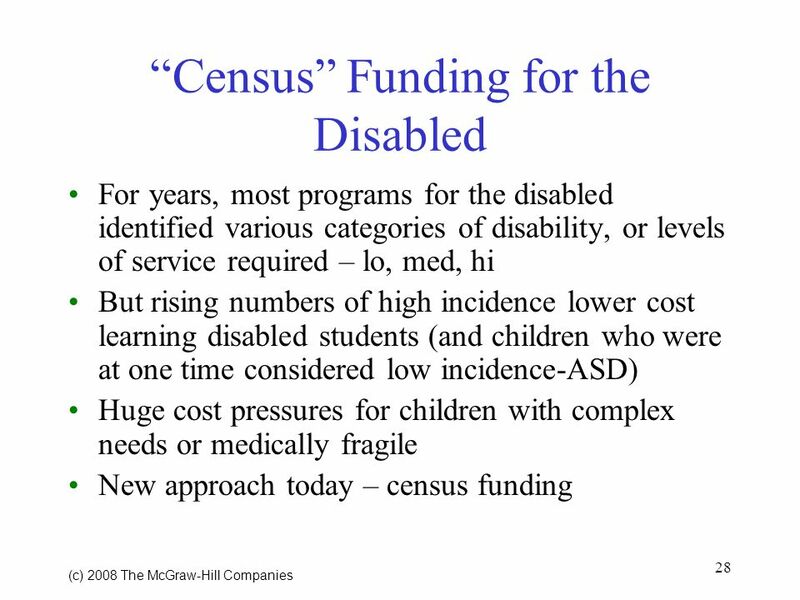 42 42 (c) 2008 The McGraw Hill Companies Development of Special Needs Programs Special Education –In 1972, Pennsylvania Association of Retarded Children v. Pennsylvania (PARC) a PA court held that district actions prohibiting disabled students from attending local public schools violated the equal protection clause of the U.S. Constitution –In 1975, Congress enacted what is now known as the Individuals with Disabilities Education Act (IDEA). 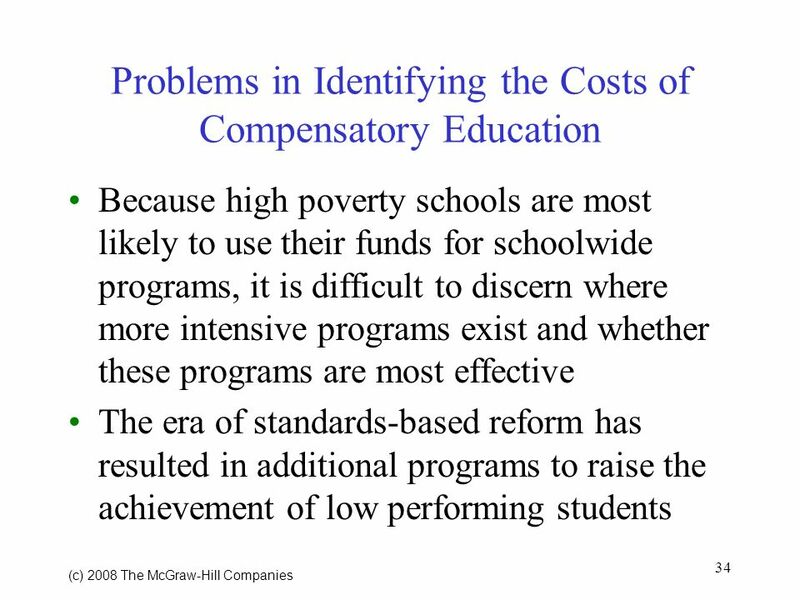 This program made access to a free, appropriate, public education program a legal right of all children. 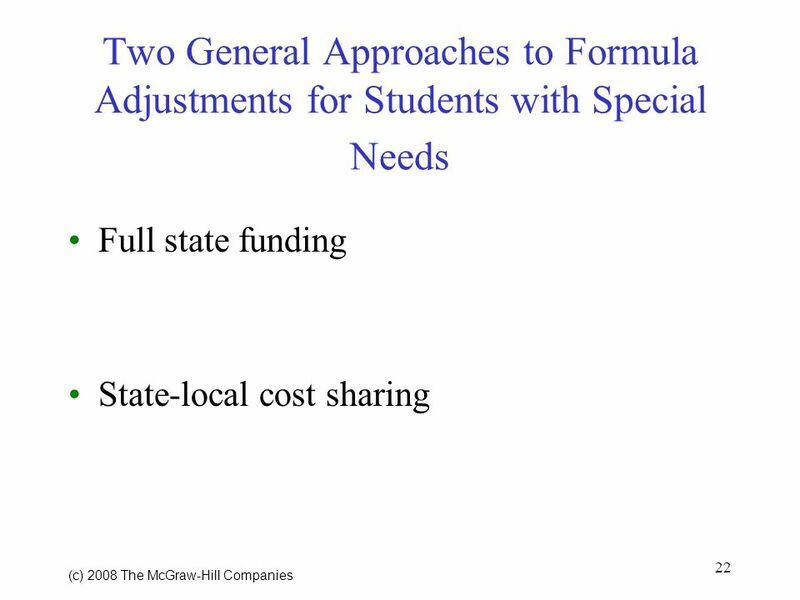 In order to receive any federal education dollars, states have to demonstrate that they are providing appropriate special- education services to all disabled children. 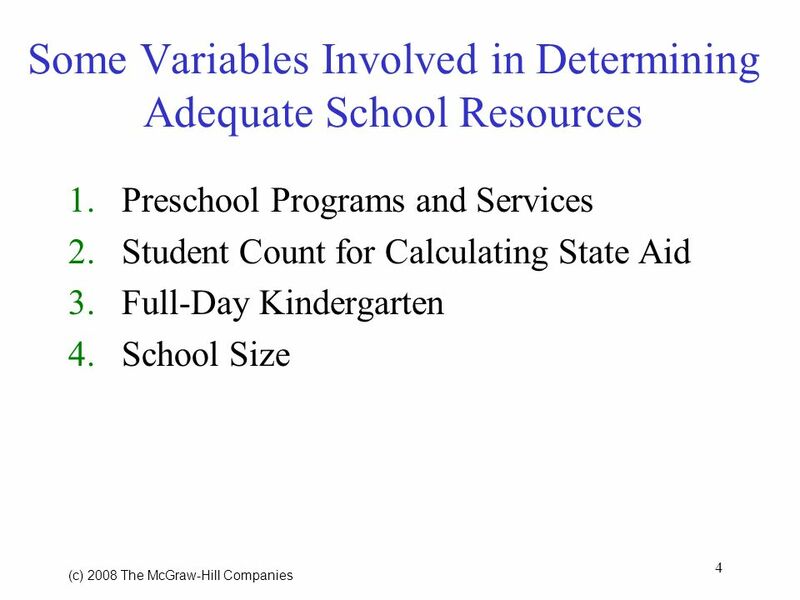 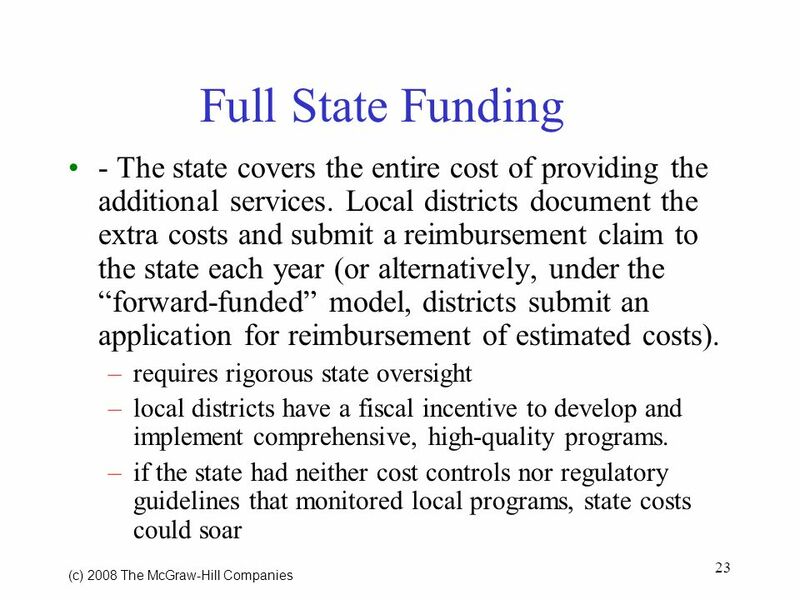 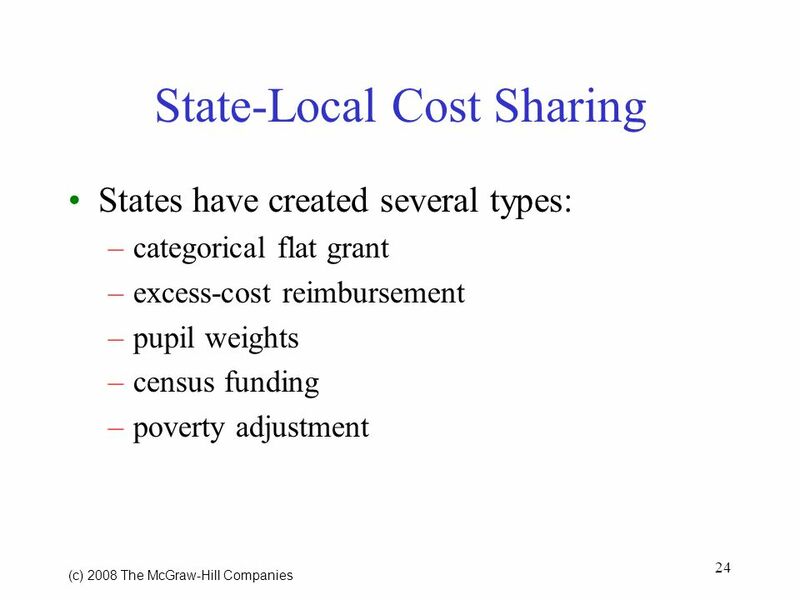 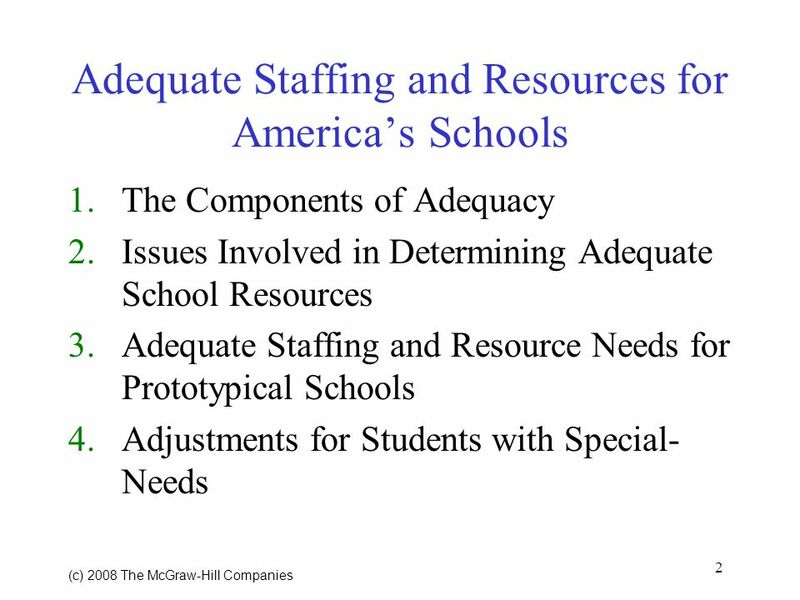 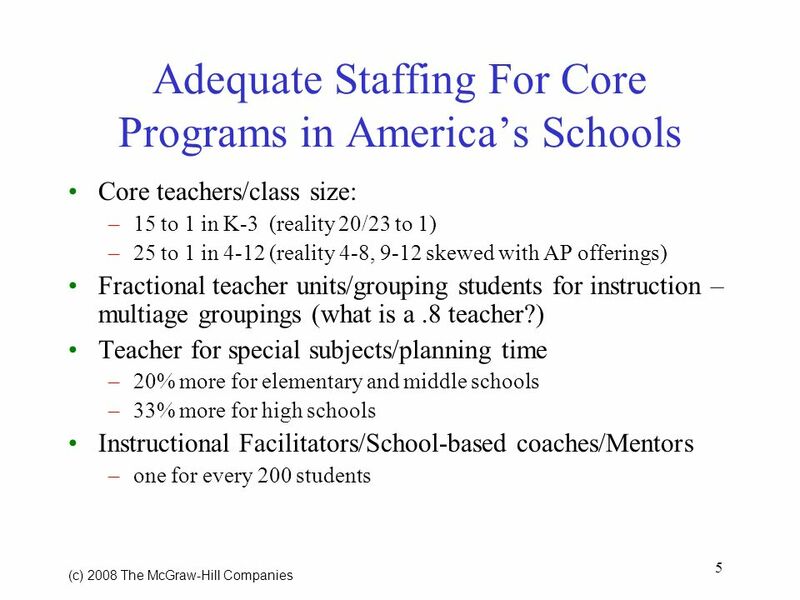 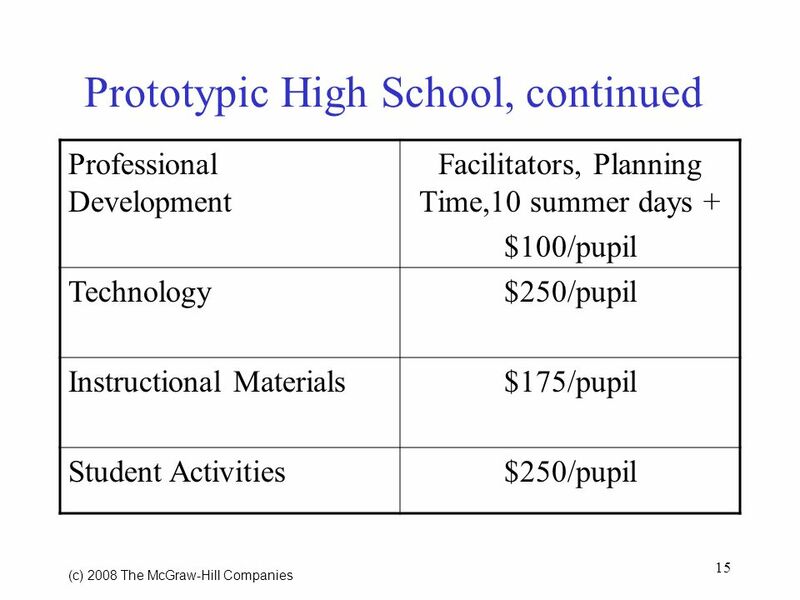 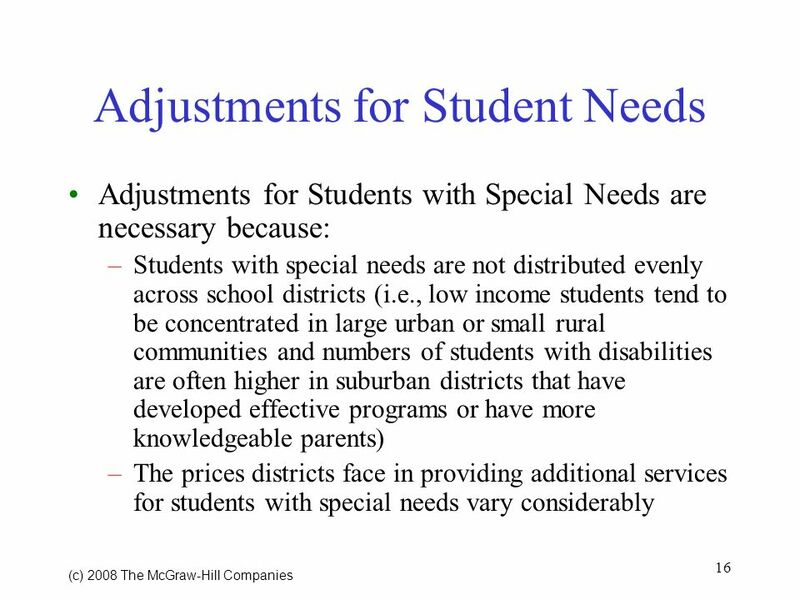 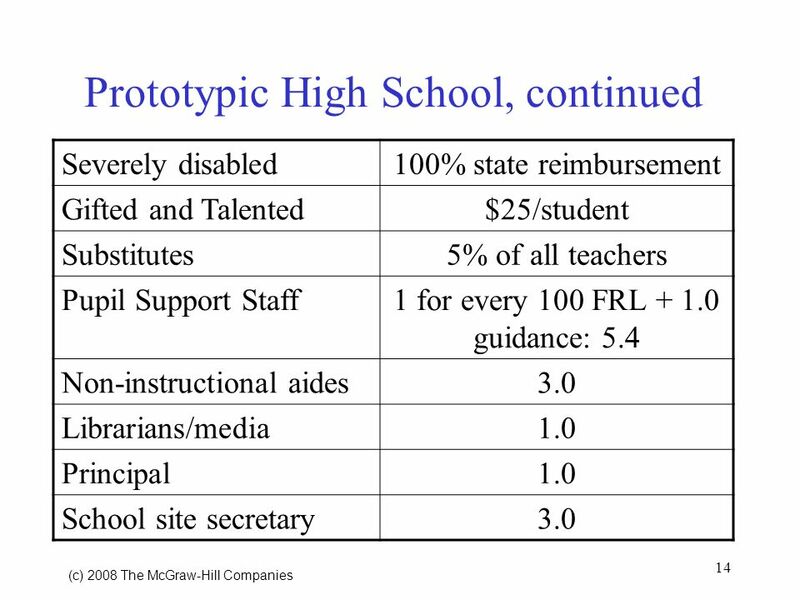 Download ppt "1 (c) 2008 The McGraw Hill Companies Adequate Staffing and Resources for Americas Schools School Finance: A Policy Perspective, 4e Chapter 4." 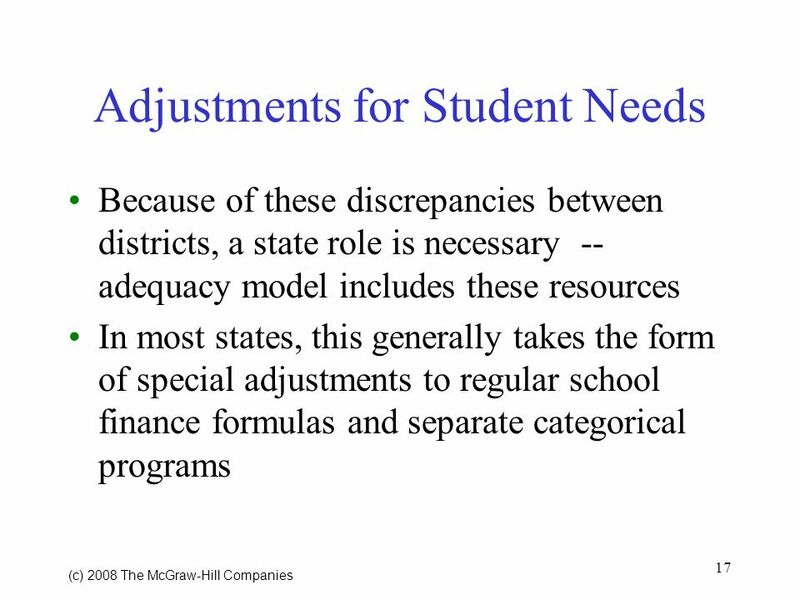 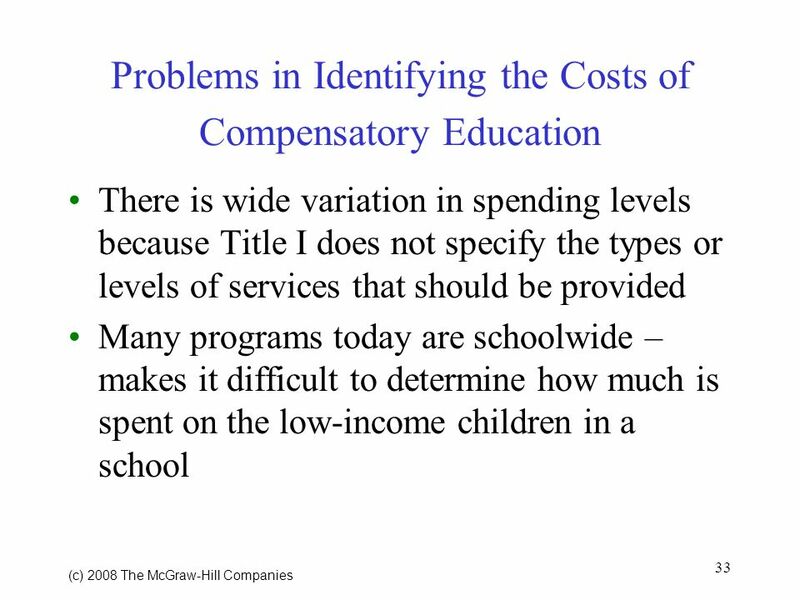 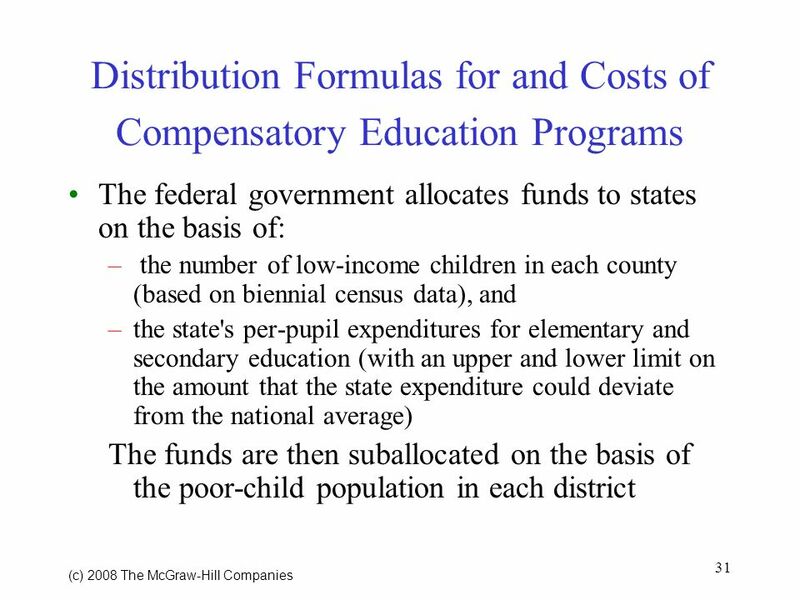 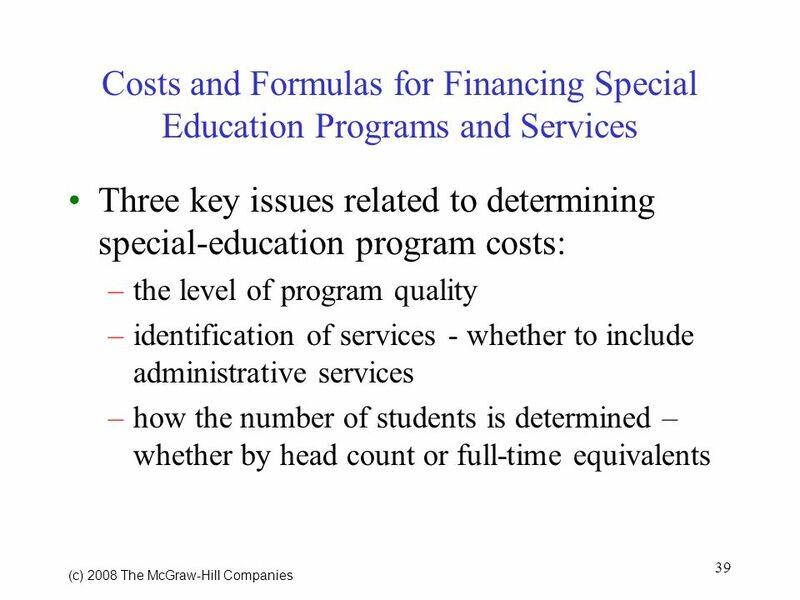 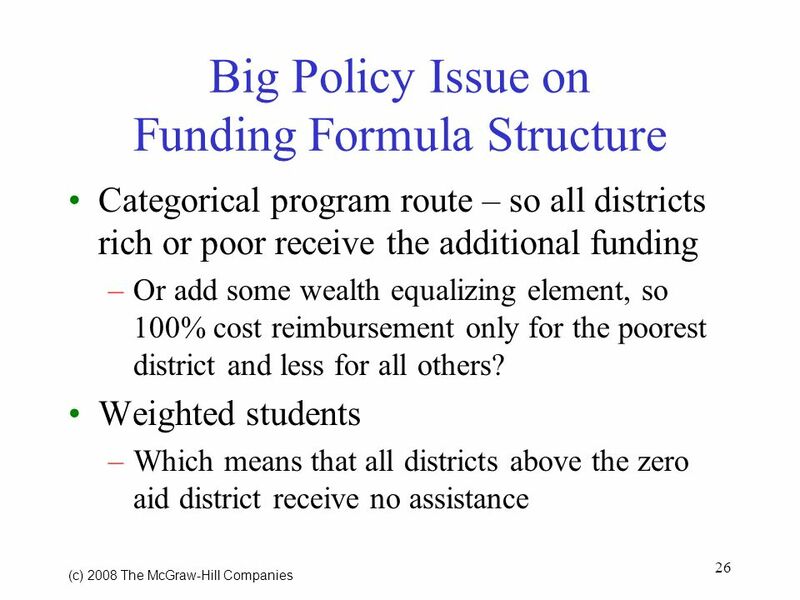 (c) 2008 The McGraw Hill Companies 1 School Finance Structures: Formula Options School Finance: A Policy Perspective, 4e Chapter 8. 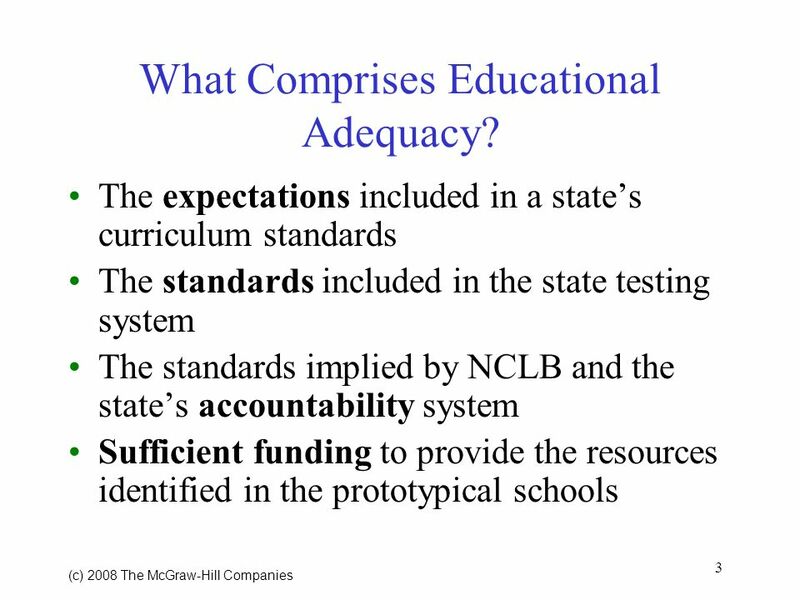 A Principals Guide to Title I Requirements. 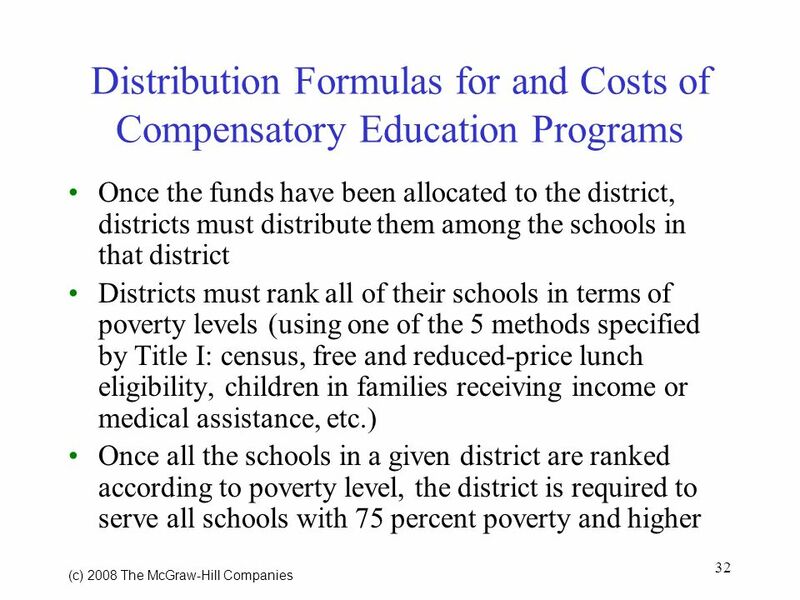 2 The Basics Signed into law in 1964 by President Johnson, next reauthorization 2007 Allocations to district. 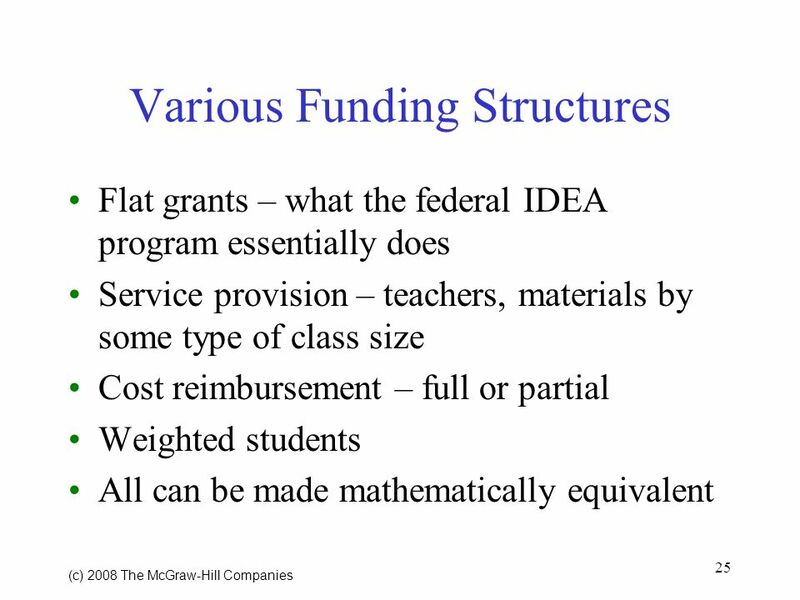 Implementing RTI Using Title I, Title III, and CEIS Funds Key Issues for Decision-makers U.S. Department of Education 1.